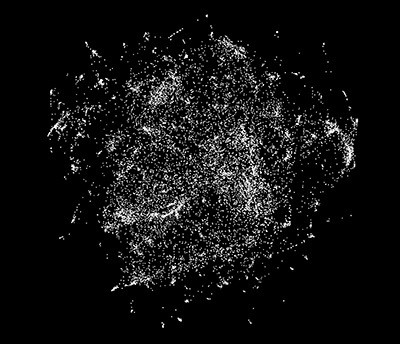 This image from GameSpace shows a constellation of all the NFL football videogames players can explore. A wide-view image shows the entire galaxy of 16,000 videogames available within GameSpace. 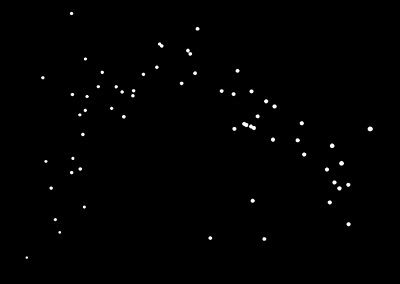 Selecting a single game from a constellation gives the player access to Wikipedia articles, videos of gameplay, and more without leaving GameSpace. Finding information about videogames can now be a game in itself, thanks to researchers at the UC Santa Cruz Center for Games and Playable Media. They created GameSpace, a playable visualization of 16,000 videogames grouped according to common features and displayed in 3-dimensional space like a vast galaxy of games available for exploration. "It takes the playful pleasure of spatial navigation that people are familiar with from games, with the same kinds of controls and feedback, and applies it to the exploration of information about games," said Noah Wardrip-Fruin, professor of computational media at UC Santa Cruz. A user flying through GameSpace will encounter, for example, a large cluster of racing games, and can then investigate individual games or look nearby to find related kinds of games. 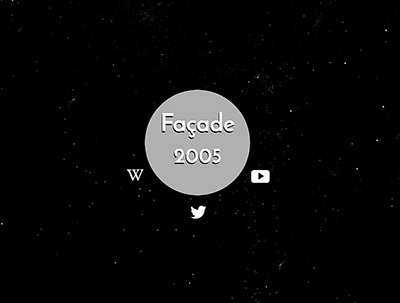 For each game, the user can read its Wikipedia article or watch YouTube videos of gameplay without having to leave the space. Released on February 14, GameSpace is available at gamespace.io. UCSC computer science graduate students James Ryan and Eric Kaltman led the development of GameSpace, with Wardrip-Fruin and Michael Mateas, professor and chair of computational media, as their primary advisers. Undergraduates Taylor Owen-Milner and Andrew Max Fisher carried out much of the development work. The GameSpace visualization is based on an analysis of all the articles about specific games found on Wikipedia (excluding incomplete entries known as "stubs"). The researchers used a natural language processing technique called "latent semantic analysis" to analyze the game descriptions and compute relatedness scores. Those scores were then used to determine the position of each game within the 3-dimensional "galaxy" of GameSpace. "We ended up with clusters that actually reflect important things about the games, with groups of games that play similarly, or that have similar cultural reactions to them, or were made by the same well-known game designer," Wardrip-Fruin said. Ryan added that GameSpace will be a living, growing visualization. Each night, the system will automatically comb Wikipedia in search of new videogame articles that have appeared since the last update; if it finds new articles, it will process them to add new games into the model. "If a user's favorite game isn't in GameSpace, she can author a Wikipedia article for it (or expand its existing stub article) and it will appear in the visualization the next day," he said. GameSpace is part of a larger project, the Game Metadata and Citation Project (GAMECIP), funded by the Institute of Museum and Library Services. GAMECIP is a multi-year joint initiative involving the UC Santa Cruz Library, UCSC Center for Games and Playable Media, and Stanford University Library to improve how libraries and other institutions catalog games, as well as game search and citation practices. "The release of GameSpace is another step in helping people discover games they might care about," said Wardrip-Fruin. "We're also working on guidelines for citation of games, and we developed guidelines for cataloging games that have been widely adopted." GameSpace builds on two earlier tools the team developed for finding games, called GameNet and GameSage. Only 12,000 games were in the network developed for those tools, which proved to be useful but did not give a good sense of the shape and structure of the underlying model, Wardrip-Fruin said. Now, in addition to having more games, GameSpace provides a tool that people might interact with for fun and learn something about games on the side.